Former 20-goal scorer and Stanley Cup champion Viktor Stalberg was placed on waivers by the Nashville Predators on Thursday for the purpose of being assigned to the AHL for conditioning. Stalberg is in the second year of a four year deal that has an AAV of $3 million. He signed the contract after coming off a solid season in Chicago where he scored nine goals and 14 assists through 47 games. The season prior he’d broken 20 for the first time in his career, notching 22 goals and 21 assists. This season he has yet to grab a point, but has only suited up for five games after going through two injuries that forced him out of the lineup. 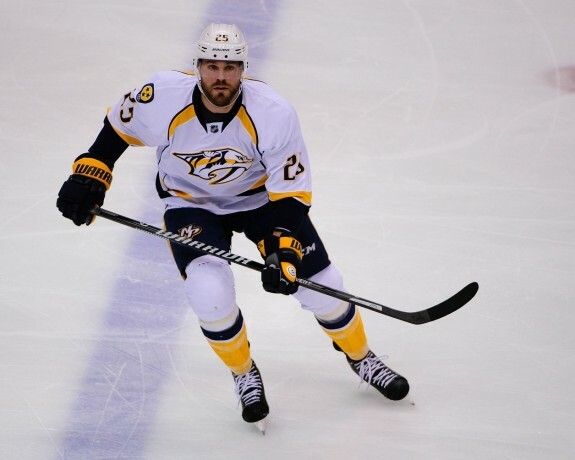 Prior to signing the deal with Nashville there wasn’t any definitive sign that Stalberg was poised to take a large step backward, but that’s been the case since arriving in Nashville. In 70 games last season he posted eight goals and ten assists. He was derailed by an early season injury and eventually saw time as a healthy scratch under former coach Barry Trotz. Now that things have gotten to the point where Stalberg has been placed on waivers, under a new coach no less, it’s become a situation that begs explanation. Should another team take a risk on Stalberg? Is there more than meets the eye with his situation in Nashvile? A quick glance at Stalberg’s possession numbers show a player who appears to have driven possession in Chicago and then fell off a cliff when he joined the Predators. Is it possible that Stalberg’s numbers in Chicago were being propped up by a strong possession team? Well, we can adjust for that. We can take a look at his relative numbers and then use Own the Puck to adjust for usage. The usage adjustment tells us a lot, especially in light of the chart above that. His high numbers in Chicago are inflated from good zone starts, but his usage has been so poor in Nashville that it’s depressing those numbers quite a bit. The usage adjustment tells us that he’s out-performing what an average NHL player should be expected to do in terms of possession with the usage he’s had in Nashville. In fact, with the exception of his first season in Toronto, he’s consistent had better possession than the average NHLer with his usage. He even managed to have a positive relative Corsi For in Nashville last year. That says to me that he still has value and that the offensive production might see a tic upward with more favorable deployment. His production was down last year, but he was used in a very different way than he had been used throughout his career. There might not have been as many offensive zone starts to go around as there were in Chicago, but it’s such a drastic swing that it’s unsurprising that his production dropped off. One common assessment of a player like Stalberg — someone who has scored a lot in the past and has had their production fall — is that he might work in the “right role.” The idea being that you can put him outside the top six and if he’s still able to score 10-15 goals that you’ve got a valuable player who offers depth scoring, especially if he’s still exhibiting positive possession. If it worked like that, it’d be great. A player with his speed, good size, and who has shown an ability to finish, could have a lot of value on a third line. Especially the third line of a team who generally controls possession and is a scoring line rather than a checking line. I’m thinking of Chicago, Minnesota, Detroit, maybe Tampa Bay (though they kind of have an embarrassment of riches there). That assessment might be true. But the concern here is that his generally solid possession numbers might mask an inability to play down the lineup. His scoring isn’t enough to justify a top six position on most teams and when he’s put in a more difficult position, difficult zone starts, he’s not necessarily failing in terms of possession, but he’s not able to turn those difficult zone starts into offense. Possession = offense, yes. But with most teams third line not being a scoring line that will dominate possession regularly — and if they are, why bring in Stalberg? — the net positive over another player at that position isn’t likely to be great enough to justify his $3 million contract for the next three years. Plus, his deployment and associated drop in production shouldn’t necessarily mean as big of a drop in production as we’re seeing. Look at Nino Niederreiter in Minnesota. He’s playing on a third line, working with 45.5% offensive zone starts, has a usage adjusted Corsi For of 53.3%, and has already scored 14 goals this season. 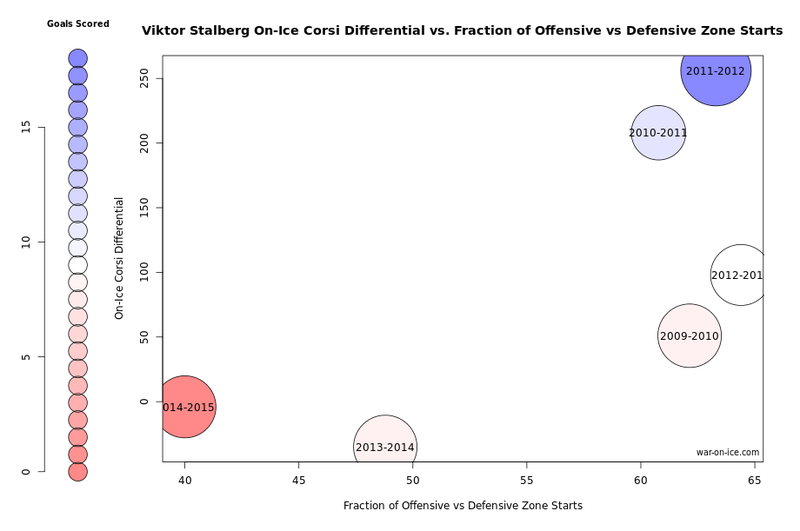 He’s an exception, but it throws Stalberg’s struggles into sharper relief. If instead of grabbing Stalberg off waivers you could acquire Stalberg in a trade where Nashville takes little in return and absorbs half his salary there might be benefit in the immediate future. But that trade seems unlikely when it doesn’t seem that Nashville believes that he’s without use entirely. The continued problem, even in that ideal hypothetical, is that with his sinking production numbers, what do we expect from Stalberg in the 2016-17 season where he’ll be 31-years old by season’s end. That contract is a lot to take on. With Nashville on the upswing and able to produce offensively at a rate they haven’t previously been able to (the top line is basically an entire line of players who weren’t with the team last year, since Filip Forsberg only played 13 games with the team last year), it’s difficult to see how Stalberg is going to regain that favorable deployment under which he succeeded previously. Nashville must hope that his ability to swing possession positively, even if it’s just slightly positive, might help a third line create good situations and zone starts for the top two lines and that Stalberg will, when injury strikes, be able to play up the lineup and find some success when he’s given that favorable deployment in small bursts. * Usage Adjusted Corsi via Own the Puck. Other stats via War on Ice.